Tuesday I bought 9 Beauregard sweet potato plants from a local store. I haven’t grown sweet potatoes in a very long time. This afternoon I started digging the bed for the plants. Sweet potatoes like a hot sunny place, so I decided to put them in a location that is already taken. The plants in the spot that I picked are hundreds of double daylilies and a lot of peppermint. I dug all that up with a garden fork. I had a heaping wheelbarrow load of daylilies to take off. The mint I removed filled a laundry basket. Later I dried some of the mint. The rest went into the compost. The bed ended up being 9 feet long and 8 feet across (or thereabouts, those figures are rounded out). 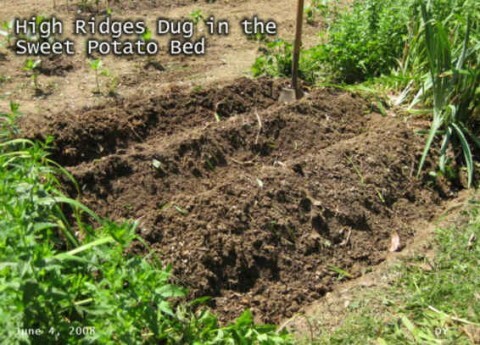 Below is a picture of the dug bed. After that I made three high ridges in the soil. The ridges are a traditional way to plant sweet potatoes. The piled up dirt allows the roots room to develop in those areas and perhaps the potatoes won’t be hard to dig up later. Believe me, digging potatoes of any kind is a hunt. I do not want to slice my produce by accident while trying to find them. So piling the dirt rather encourages that plant to put it there. That doesn’t mean the plant will cooperate. At this point, a person can plant the sweet potato plants in the top of the ridges spaced at around 12-18 inches. Keep the area weeded until the vines shade out weeds. 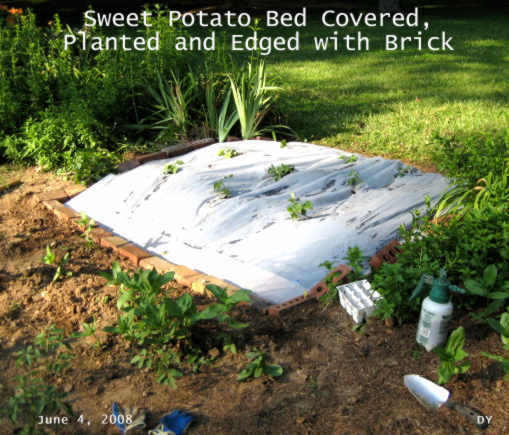 Instead of planting at this point, I cover sweet potato beds with black plastic. This time I used black-lined clear plastic. This isn’t a plastic that can be bought, I lined it myself because I did not have a large sheet of black plastic, I used 4 black garbage bags. I use black plastic for its heat absorbing properties, to keep the weeds down, and to keep the ridges from being compacted from too much rain and from me trying to weed the area. I placed the plastic over the bed and secured the edges. After that I planted the 9 plants, 3 per ridge. I slipped the water hose into some of the holes and watered the area just to get it damp. I’ll water the plants just until they are established. Sweet potatoes like hot dry weather and will not need much water. After all that, I tightened the plastic and secured the edges with brick. I don’t want much sag in the plastic. I want the furrows to be open to encourage the potatoes to develop in the furrows outside of the dirt as well as in the ridges. 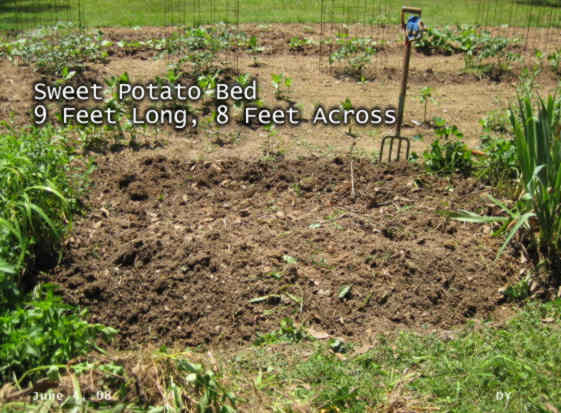 Below is photo of finished sweet potato bed. When I planted the sweet potatoes, I sprayed the plants and the hole with water mixed with liquid kelp that I buy from Gardens Alive. The little hand pump shown in the image is an invaluable tool for the small garden. I filled it 3 times today to spray the liquid kelp/water mixture on all of the plants in the garden as well as all of the other plants that I transplanted today. Edited to add: Harvest sweet potatoes before the vines are damaged by frost. Carefully dig with a garden fork while trying not to damage the potatoes. Lay the sweet potatoes on the ground for a few hours to cure. Then cure them in an airy warm (85-90 F.) place for 10-15 days. After that, store sweet potatoes in an area that is around 50F. (but not less than 50F.) with moderately high (75-80%) humidity. I have to ask. What is the liquid Kelp for? Your garden looks great. 🙂 When do you expect to harvest potatoes? My neighbor gave us some that he grew a few years ago and they were soooo much better than the store bought ones. Wow, Donna, you have been very busy. Your garden looks great! I’d like to have a garden but I am not willing to put all the work into it to leave it in the next year or so. Michelle, sweet potatoes are supposed to be harvested before the vines get hit with frost. Frost damage to vines can also damage the sweet potatoes. Homegrown potatoes are better tasting, especially the white potatoes. They are so good! Michelle, I forgot to answer the kelp question. Kelp is basically seaweed and seaweed has been used as a fertilizer for centuries. It is an excellent fertilizer. In this case of using it for transplanting plants, seaweed has properties that stimulates overall growth as well as root growth. When we actually get around to setting up our garden, creating the raised beds and all, then I’ll attempt potatoes. We buy fresh Alaska Grown potatoes up here and they are really good. Our favorites are the Yukon Golds though for baking purposes I like to buy Idaho Russets, found out Idaho grows some awesome potatoes when I was in college. I don’t know that sweet potatoes can be grown up here or not. Nope, I don’t think they’ll grow up here unless one had a good greenhouse to grow them in. Where I’m at the growing season is 100 or less days. This year the potato farmers have just been getting their crops in the ground due to the late snow and cool spring. The crops aren’t growing at their usual rate this summer. I’m thinking that we may not have the record breaking veggies a the fair this year. You can grow sweet potato plants from a sweet potato but it is a different process than it is with potatoes. 1. Expose the sweet potato to warmth for a few days (some lay the sweet potato on top of a water heater)Handle the potato gently from this point on to prevent rot. Be careful to not break any of the buds. 2. Bury the sweet potato around 2/3 deep or so in moist soil or moist potting soil. (some suspend the potato partly in water with toothpicks) Keep the temperature warm (65-70 degree F) Keep the soil moistened, but not wet. 3a. Twist off the slip with roots intact. This method is the risky one. You risk transferring any disease the stored potato may have into your garden. 3b. 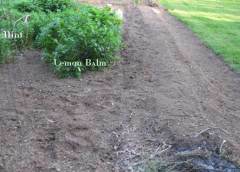 Cut the slips off one inch above the potato and root the slips in either water or moist potting soil. We’ve got some sweet potato slips ready to go – kind of by accident (they started growing on my sweet potato before I could eat it.) I’ve since twisted them off and put them in water, and they’re growing like crazy. I think they’re ready to plant, but is mid July too late? I live in Southern California – we’re having 105 degree days here, so I think I’ve got the heat. Thanks for this great post – you’ve given this non-gardener an excellent how-to!